Mister Greggy Guarantees Your Guests Will Have A Giggly, Silly, Funny, Amazingly Wonderful Good Time They'll Always Remember! Fills your theater with laughter! I'll help you create one of the most unique, fun and memorable events you and your guests have ever experienced! Making your special events memorable can be a difficult task. You want it to be fun, exciting and successful - all while staying within a budget. See Mister Greggy in Action! NEED a full stage show to fill your theater? I've got you covered. How about continuous strolling shows to entertain hundreds or thousands of patrons throughout the day? I'm your man. Even if you're looking for the perfect party entertainment to make your small gathering the best ever... I'm the guy to call! My shows are geared specifically for your event. I can even customize them to fit with your theme! Your performance was greatly enjoyed... the reviews were terrific! ... enjoyed doing an interview... he was soooo good! Thanks so much - yesterday was a huge success! You are professional and obviously enjoy performing! Mr. Greggy... was absolutely outstanding by the measure that matters most: the children loved him. They never took their eyes off him and they laughed and laughed. The show exceed my expectations in every way. It was money well spent. 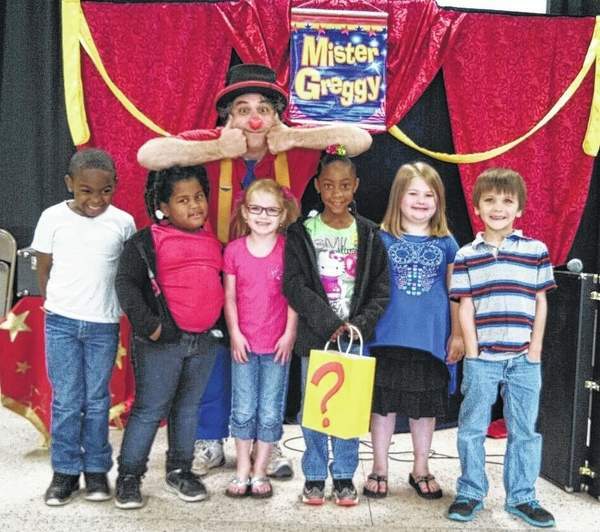 After 20 years, I still consider Mister Greggy (formerly The Wizard of Odd) one of the best family entertainers in the Atlanta area, and THE BEST entertainer for young children. More LPM (Laughs Per Minute) than anyone else in the business. Thank you for a magnificent performance today at the Sandy Springs Library! The children really enjoyed the program! Mister Greggy arrived early, was very polite and professional. He entertained for three hours straight with no break. He made people laugh and kept them all interested and entertained. He is a very seasoned entertainer and probably worth more than what I was able to afford. I would definitely hire him again. Greg McMahan is the most consistently humorous entertainer that I have had the pleasure to watch. Over the past twenty years, I have seen his show over and over again and I am ALWAYS amazed at how the kids respond. From the moment he begins, the kids are in a state of wonder and excitement as he humorously unfolds his tricks one after another. Greg is a true performer as he sincerely loves what he does and it shows as he laughs along with the kids. Greg is an Atlanta Treasure not to be missed! Mister Greggy got more laughs than any other magician we have used! The kids really enjoyed Greg. We would definitely use him again! He was extremely patient with the kids (age range 2-8) and appeared to enjoy what he was doing! Thank you. Mister Greggy (The Wizard of Odd) was fantastic at the Northeast Georgia Medical Center Marketplace in November. The children loved him and he kept all the children mesmerized the entire time. He was also very nice, courteous and prompt. I would definitely recommend him as entertainment for children functions in the future. The neighbors had a great time, as usual. The balloon entertainment is always a hit with the kiddos & parents!! Greg is hilarious and he knows what makes kids (and grown-ups!) laugh! He is one of my favorite children's performers and one of a very small group that I recommend when I can't do a show. Invite Mister Greggy to your next event and watch the fun! You'll be glad you did! Greg was perfect entertainment for our Easter Brunch. All the parents commented on his abilities and response to the children. Thanks. The kids seemed to enjoy him and laugh and he did not leave until every child had a balloon--which was a later time than we scheduled. He really seemed to enjoy his work and not treat our BBQ as "just another job"--so that was nice. Thank you. Thank you so much! We really enjoyed having you at our Chili Challenge yesterday! The kids loved you and the grown-ups were talking about you afterwards! You added fun and warmth and personality to our day... we'll be in touch in the near future. Thank you!! I wanted to let you know how much we enjoyed the Mister Greggy (Wizard of Odd). The kids loved him! I even caught myself watching his tricks in amazement. He came early and left late and because of his performance I have told many people about him and his act. Our many thanks to Mister Greggy (The Wizard of Odd) for being so funny and entertaining at our Children's Holiday Party. He kept everyone laughing, adults included. The kids loved him being so goofy and his magic, and he seemed to enjoy making the kids laugh. Your performance at our Preschool was fabulous!! Big Hit. The best we've seen! Thx again. To be honest with you Greg is the best entertainer that I have scheduled here at The Salvation Army Child-care Center. Greg arrived on time, and went right to work, our children were totally entertained! All of his magic tricks and goofy humor was wonderful!! I think that his one on one interaction with the children is what impressed me the most. I enjoyed watching my daughter laugh hysterically the whole time... thank you for making it such a nice birthday for my daughter. This is a very belated THANK YOU!. You were a hit at Declan's birthday party and I appreciate your patience with the kids. Many parents told us that their children are still talking about it. I know that Declan and, my other son, Logan had a blast with you. Ellie's party went very well and the kids really enjoyed the performance. The act was very age appropriate and the length was good. We loved the show! We were particularly impressed by how well Greg kept the children's attention! Greg was warm and funny, a real pleasure. Everything was great. Everyone loved the act, even the adults had a great time. Mister Greggy (The Wizard of Odd) was excellent. The kids were so into his whole act. Don't change anything. Greg did a fantastic job! We had kids from age 2 to 12 and all of them had a blast! I'm positive that most of the adults also enjoyed Greg's tricks too. ;-) He was fantastic!!!! Greg arrived promptly and immediately grasped the children's attention. They laughed so much, shrieking and rolling around. He held their attention for 1 hour - amazing. He was awesome! I was worried about how he was going to entertain 20+ 3 yr olds -- No prob for him -- He was fantastic! Fantastic performance, enjoyed by adults and kids! I picked your name out of a magazine so I really didn't know what to expect. We were not disappointed! We thought he was wonderful! The boys & our guests could not stop talking about how fun & entertaining Greg was. He's just perfect - don't change a thing! The birthday party was wonderful. Anyone who can keep a group of 5-year-olds interested and laughing for an hour deserves a medal. They loved it!!! Nothing could have made it better - he was A+ in every way. He has a tremendous rapport with children. Greg is a genuinely nice man and a very talented performer. He made Rachel feel very special & kept the attention of all children for well over an hour & that's why we gave a $50 tip. The children were captivated with Mister Greggy (The Wizard of Odd). He was able to maintain their interest for the full hour. He also handled the unruly ones with grace. I would not hesitate to recommend him. Show was lots of fun for the kids. They all (16 kids) sat and laughed. Nobody walked away. He handled them very well when the kids tried to disprove his magic. Great job. The show was great! All the kids were screaming with delight! The balloon sculptures were very creative. We would hire Mister Greggy (The Wizard of Odd) again. Mister Greggy (The Wizard of Odd) did a great job. The kids loved him. He had them completely involved, amazed and laughing on and on. He was a great help at the party. Very prompt, very involved with the kids. Bravo! We loved Mister Greggy. He made Shelby's birthday party perfect. He was on time, funny & great. Everything we could have wanted in an entertainer. Mister Greggy was on time & started right away, he made everyone laugh and had a great time. His whole act was wonderful. I have nothing but good things that I could say about him. I will use him for other functions. Thanks. He was excellent. The kids loved him. The length of the show was great and he kept the kids interested. The tricks were wonderful. He was a pleasant person. Would use him again. Thanxxx. Imagine a stress-free event where your guests enjoy my hilarious, laugh-packed Goofy Magic Shows full of amazing magic, respectful audience interaction, visual humor, colorful balloon artistry and a trunk full of magical surprises. They may even learn a few special tricks of their own to dazzle their families and friends back home. Even though my busy schedule often fills up weeks or months ahead of time, it's still possible I may have one or two time slots available. However, those book up fast so it's always to your advantage to get a free no-obligation price quote NOW! Contact me now for a quick, courteous, no obligation quote, or better yet call me directly (404-452-4620) to discuss how I can make your big event a complete success! I look forward to making your event a huge success! What are your fees and deposit policy? Fess vary from event to event. There are several factors to consider with each booking… type of performance, show length, size of audience, travel distance, etc. Most bookings require a $50 deposit, paid via PayPal. You don't have to register with PayPal to use it, and other arrangements can be made. I am flexible and can make exceptions. The remaining balance can be paid at the event, via cash, check, PayPal or credit card. If you need an invoice, please let me know in advance so I can send you one with all the details. When you contact me about your event, please include as many details as possible so I can give you an accurate quote. You can also call me at 404-452-4620. How do we go about confirming your appearance at our event? Easy, just contact me thru this website, email to Greg@MisterGreggy.com, or call me directly at 404-452-4620. When you contact me about your event, please include as many details as possible so I can give you an accurate quote. What will you do at my event? I have many types of entertainment to choose from, and they are all available for your events. When we are going over your event details, I'll explain what I have to offer and how they can help make your event the best ever. For instance, for company picnics I've found that a combination of strolling entertainment, balloons, and a stage show work very well together. 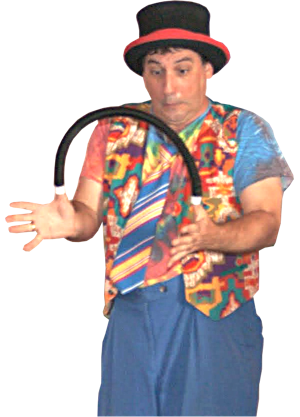 My Goofy Magic Show is a squeaky clean comedy magic show which also includes juggling, clowning, puppetry and plenty of audience participation. It can be presented on just about any stage or at street level. The show length is very flexible, anywhere from 20 to 90 minutes. Up to 4 shows can be presented throughout the day at regular intervals. For birthday parties, the guests are entertained from the moment I arrive. 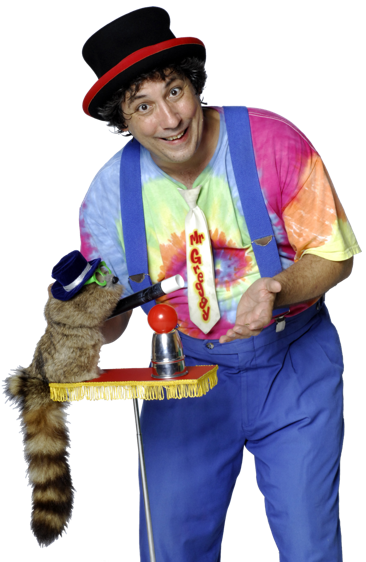 The show, best for ages 4 and up, includes comedy magic, clowning (but no clown makeup), a bit of juggling and finally my furry puppet pal Rocky and his "Super Sensational Circus Stunt"! Of course the birthday child is a huge part of the show as their friends discover she/he can do magic like the pros! After the show is a short break for the kids to get a drink, snack or bathroom (about 2-5 minutes). Then I'll start making balloons for all the guests with the help of the birthday child. Another option is for me to teach everybody how to make their own balloon animal as well. For older kids age 8 and up, I can teach everybody how to do magic tricks or how to juggle. My balloon show uses my "no-line" balloon sculpting technique. This ensures your guests will be entertained while getting their balloon animal, hat, flower, sword... whatever they want. It's a non-stop balloon performance that can make up to 100 balloons/hour and nobody waits in line! Strolling entertainment keeps your guests smiling and laughing all day. 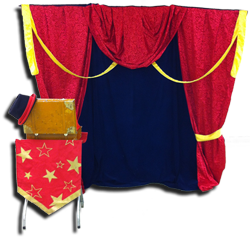 I'll generate the perfect atmosphere, bringing laughter and smiles to your guests with close-up magic, puppetry, clowning, juggling and lots of silliness! If you have other questions, please contact me. You can also call me at 404-452-4620. Are you available for the date & time I need you? My schedule varies, and certain seasons are busier than others. October is usually a very busy month, and during the summer I'm booked at Circus Camp during the weekdays. Whatever the season, always feel free to check if I have the date open that you want. If I'm not available, I will gladly refer you to other performers I know who are very entertaining and professional. For smaller events, such as birthday parties, always contact me first before sending out invitations or booking a party room. If I'm already booked, it's easier to adjust the date or time to suit both our schedules. Then you can send out the invites knowing I'm booked for your party. When you contact me, please include as many details as possible so I can put together a great package that will be perfect for your event. You can also call me at 404-452-4620. How much space do you need to set up your show? My set up is very flexible, I can utilize whatever space is available. The smallest size space is usually at birthday parties in the living room, with the children sitting on the floor. In those situations I can set up in the area that 3 people standing next to each other would use. It's best if I'm positioned facing the main light source, otherwise the audience has light shining in their eyes during the whole show and that can be uncomfortable. For larger indoor venues I can use by portable backdrop, which sets up in about 2 minutes. This adds a great theatrical look to your event. Can you perform your shows outside? Many events are by their very nature outdoor events... fairs, festivals, amusement parks, etc. My stage, balloon and strolling entertainment is designed to work just fine in those situations. However, outdoor birthday parties are always risky, and I usually advise against them. If the backyard is the only space with enough room, assume it will rain and plan accordingly. The worst thing to do is cancel a party and disappoint all the children who were looking forward to the fun. Any area that is covered, such as a back porch or gazebo, is the natural choice for setting up the refreshments and cake. Use any available tents, perhaps asking a few guests to bring theirs (like a picnic party). Shade is very important, especially in Atlanta during the summer. Nobody would enjoy a party in the direct sunlight for 2 or more hours. Mosquitoes and other bugs will also be a concern, so have plenty of insect repellant sprays around. Noise and wind can cause problems as well. Do you bring live animals for your show? I don't have any live animals in my show. However, one of the most popular parts of my show is Rocky Raccoons Sensational Circus Stunt! Rocky will sometimes attempt to jump thru a hoop of "Real Fake Fire", or perform an amazing card trick, or surprise everybody with something new. Rocky is a special type of puppet called a "spring animal". He looks very real, and the children love him. Do you wear clown makeup? I never wear clown makeup, although occasionally I wear a clown nose as you can see in the photo. My costume is colorful. I understand some children (and adults) are nervous around clowns, so I respect that. Plus it's a hassle to apply and remove and my skin does not react well to it. Is your show age appropriate?? I learned early on that I should always perform as though my grandmother were sitting in the audience... keep it clean. I've continued that lesson all my life. 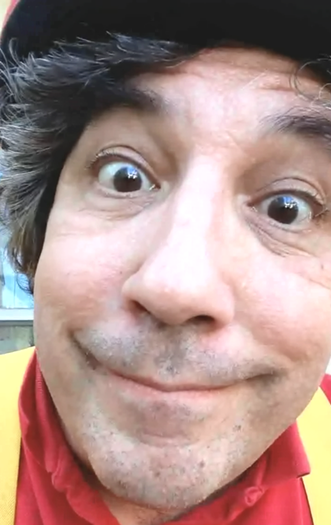 My Goofy Magic Show is designed for 4 year olds and up. Younger children still enjoy it, but because of their short attention span they may begin wandering around and disrupt the performance. Adults also laugh right along with the children, often enjoying their reactions as much as the comedy. 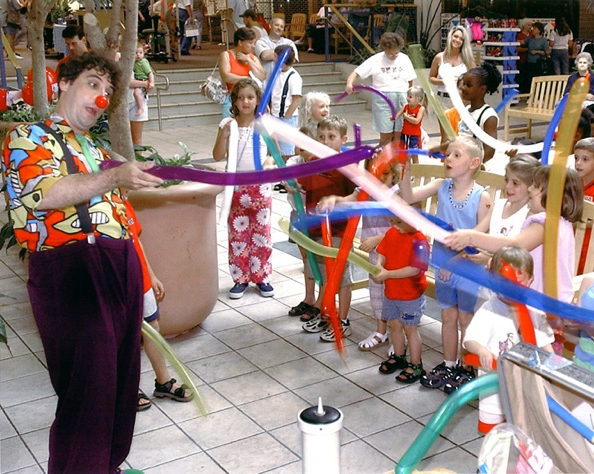 The strolling entertainment and balloon shows are suitable for just about any age. Just make sure to keep balloons out of the mouths of really young children since it could be a choking hazard. Can we serve the children snacks and drinks during your show? Serving snacks & drinks during the show becomes a HUGE distraction for the kids. I HIGHLY recommend NOT serving anything during the performance. My show features a lot of audience participation, so it's inevitable that food and drinks will be spilled, or worse yet, thrown... it could turn messy. I perform mainly in the metro Atlanta area, but often I travel to other cities and states. If I do travel outside metro Atlanta, I adjust my fees to take that into account. Born at an early age, Greg McMahan loved performing as long as he can remember. In the mid 1970's, Greg became interested in magic, sleight-of-hand and other forms of prestidigitation including juggling, puppetry and clowning that has continued to this day. During this time he also began working at his school's brand new computer lab for fun and he joined the yearbook staff to learn graphic design. Since 1992, Greg has worked with Circus Camp. This summer camp in Atlanta teaches children various circus skills such as trapeze, juggling, magic, unicycling and much much more. With years and years of performing experience, it was only natural that younger entertainers would seek him out to learn the craft. 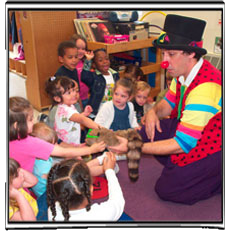 This new career direction prompted Greg to conduct lectures and seminars for other children's entertainers worldwide. He's also written many books and articles. Mister Greggy fills your theater with laughter, amazement, thrills, giggles, participation and delighted guests who will cherish your event forever! Your guests will appreciate how my squeaky clean Goofy Stage Shows are perfect for just about any age group! You need to ensure your guests enjoy an excellent stage show... so you need to know the entertainer will show up on time and deliver a great performance. That's where my 40+ years of experience comes in handy. Just about any situation you're dealing with is familiar to me, so you can rest assured that your event will turn out fantastic... I can perform just about anywhere, I'm punctual and my show is hilarious! WHETHER headlining the main stage or performing on the midway, loads of audience participation guarantees your guests will be laughing themselves silly. Birthday Parties with Mister Greggy! …when you invite Mister Greggy and his popular Goofy Magic Show to your celebration! Greg arrived promptly and immediately grasped the children's attention. They laughed so much, shrieking and rolling around. He held their attention for 1 hour - amazing! 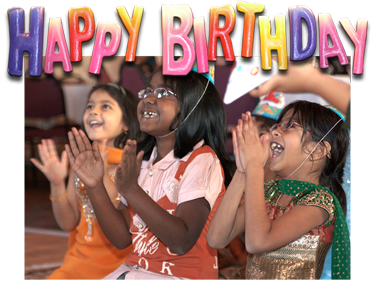 I personally guarantee your child's birthday party will be a truly special and memorable event. Your child will have a starring role in this laugh-packed show. Some of the magic actually happens in their very own hands! My squeaky clean shows are age appropriate and loaded with kid-style comedy and amazing visual magic. Colorful balloon animals for each of the kids is a hugely popular way to top off the performance. My Goofy Magic Show is very flexible and can be set up almost anywhere in about 30 seconds. Guests may sit as close as they'd like. So, even a small room or gathering space is perfectly suitable. All shows are customized to fit the specific age range of your guests, although it's best when the majority of the kids are age 4 and up. That's where my 38+ years of experience comes in handy. Just about any situation you're dealing with is familiar to me, so you can rest assured that your party will turn out fantastic... I can perform for just about any age group, I'm punctual and my shows are hilarious! with hints & tips to help make your party a lot easier and a lot more fun! Mister Greggy's Strolling & Balloon Entertainment generates the perfect atmosphere... your guests will be happy & cheerful during your fair or festival, creating wonderful memories which brings them back year after year! 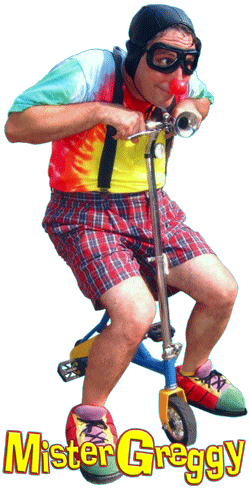 Your guests will laugh, giggle and smile every time they see Mister Greggy strolling down the midway at your fair. WHETHER you're expecting a few dozen or many thousands of guests, you need to guarantee they're entertained and happy from the moment they enter your fairgrounds. That's where my 40+ years of experience comes in handy. Just about any situation you're dealing with is familiar to me, so you can rest assured your event will turn out fantastic... I can perform just about anywhere, I'm punctual and my shows are hilarious! Strolling on your midway or managing your entire children's activity area, Mister Greggy makes sure your guests will remember your fair or festival as the "must attend" event every year! Mister Greggy's Balloon Extravaganza Children's Activity Center! ACTION packed balloon twisting activity area where every participant will learn to make their very own balloon animal or fancy hat. Your guests will even be taught how to balance a balloon on their nose. For the grand finale, everybody marches in the circus balloon parade to the delight of the crowds! As an added bonus, throughout your event children & adults will help build the largest balloon tower they've ever seen... The bigger the crowds, the bigger the tower! This is a great way to get the media involved, as the local news anchors broadcast live from your festival with daily balloon tower updates. Contact me for more ideas about getting the media interested in the balloon tower!